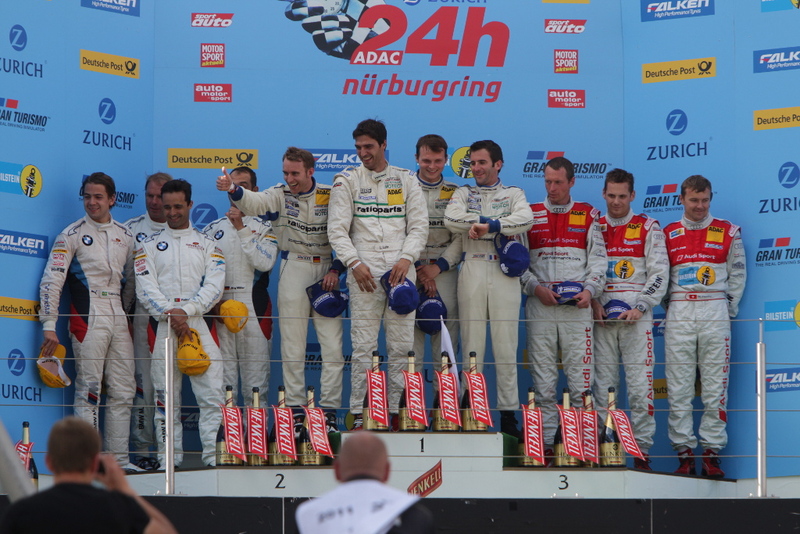 Despite taking the third spot on the podium, Audi had plenty of reason to celebrate following Sunday's close of the 24 Hour race at the Nurburgring. In addition to a third place overall finish, the #14 Audi R8 LMS of Audi Sport Team Phoenix claimed the R8 LMS' third-straight GT3-class victory, leading a perfect 1-2-3 finish in the the class. Topping off the weekend's triumph was an Audi TT RS fielded by Raeder Motorsport, finishing 14th overall and clinching the SP4T class win. Full report and more photos after the jump. 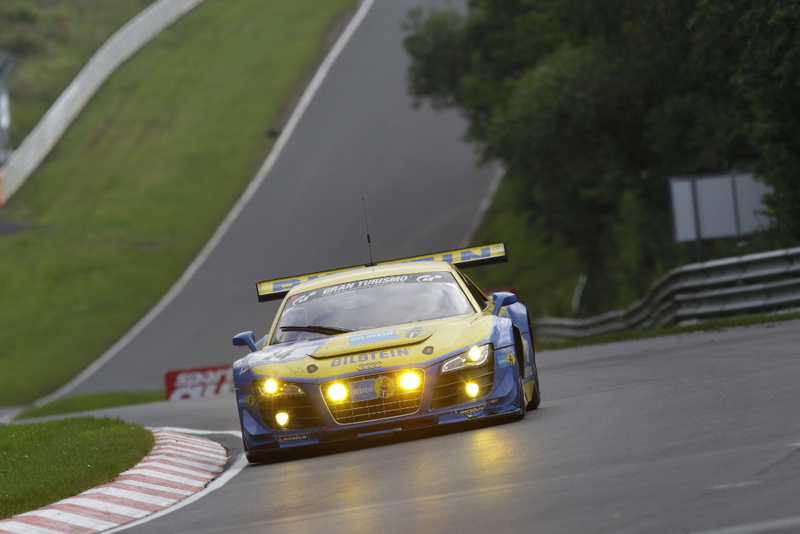 Ingolstadt/Nürburg, June 26, 2011 – The Audi R8 LMS was once again class winner on its third outing in the 24-hour race at the Nürburgring. 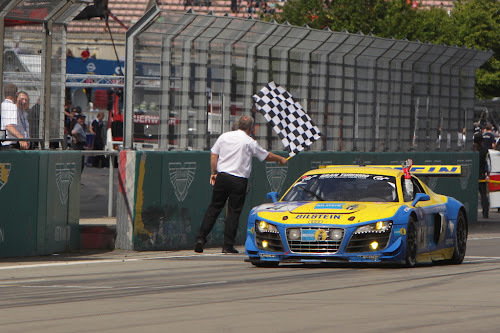 The mid-engine sportscar from AUDI AG won the GT3 car class for the third time in succession and, like last year, finished third overall. 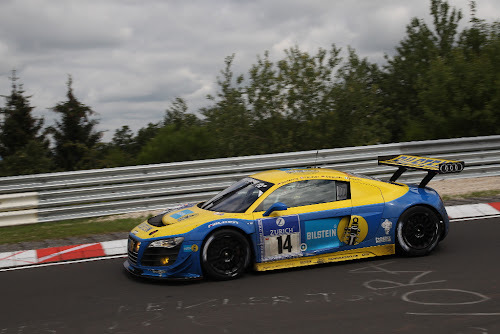 The Audi TT RS also impressed in front of the 250,000 spectators: the quattro GmbH development demonstrator took the checkered flag in 14th position overall and won the SP 4T class as best front-wheel drive car in the field of 202 cars. 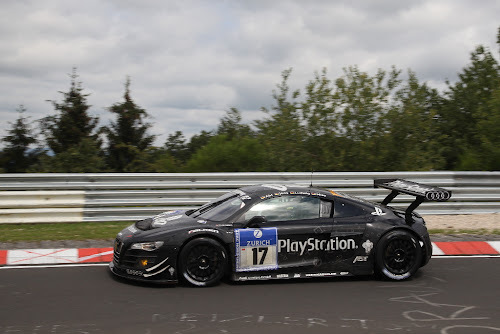 In a thrilling finale, the Audi R8 LMS #14 of Audi Sport Team Phoenix driven by Marc Basseng/Marcel Fässler/Frank Stippler passed the Mercedes SLS, class leader at that time, 43 minutes before the finish when it to pit with a technical problem. 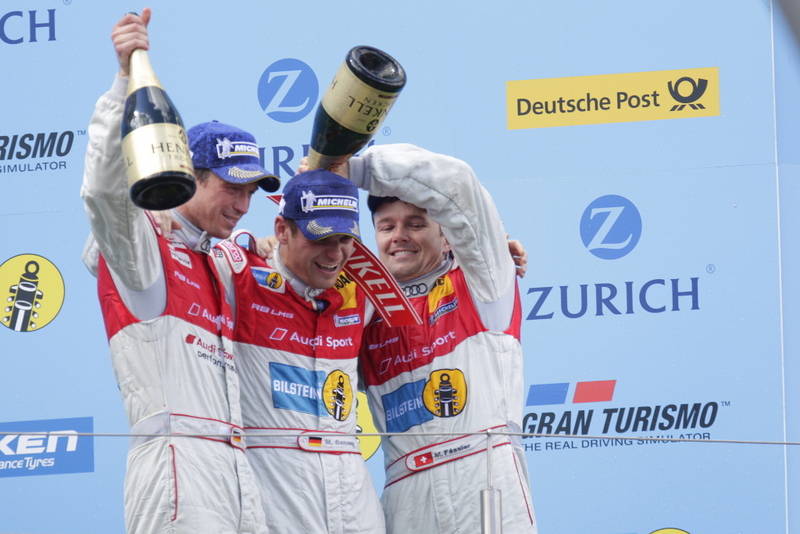 Christopher Haase/Marc Hennerici/Markus Winkelhock (Audi Sport Team Phoenix) and Mattias Ekström/Timo Scheider/Marco Werner (Audi Sport Team Abt Sportsline) completed the Audi one-two-three in the GT3 class after taking fourth and fifth positions overall at the finish. Start number "14”, the best placed Audi R8 LMS at the finish, lost around four minutes due to a loose front splitter just before 21:00. Early on Sunday morning the front splitter was changed , which meant an additional time loss of 2m 50s. Despite this, Basseng/Fässler/Stippler could still move up to third place. In the opening stages of the race the second Audi Sport Team Phoenix Audi R8 LMS with start number "15” had contact which necessitated a quick repair. On Sunday morning Markus Winkelhock lost time in traffic because the high beam flash did not function and he was unable to warn the slower cars of his approach. The problem was solved after changing the steering wheel. Christopher Haase, Marc Hennerici and Markus Winkelhock dropped behind the sister car at the end on Sunday afternoon due, in part, because they lost time twice during refueling. 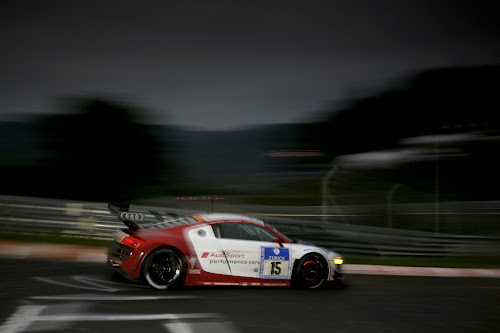 Mattias Ekström, Timo Scheider and Marco Werner held second place overall at times during the night in the Audi R8 LMS #16 entered by Audi Sport Team Abt Sportsline, before Marco Werner was the innocent victim in a collision at 4:53 in the morning and in which the front end of the R8 LMS was badly damaged. The repair took just five minutes but threw the #16 out of the leading group. The second Audi R8 LMS from Audi Sport Team Abt Sportsline (#17) lost 20 minutes at the start of the third hour after a relay loosened and paralyzed the R8 LMS sportscar’s on-board electronics. After rejoining the race in 66th position Christian Abt, Christer Jöns, Luca Ludwig and Christopher Mies had scythed their way back up to eighth overall when Luca Ludwig became a victim of the ensuing drizzle and slipped off the track in the "Quiddelbacher Höhe” track section at 3:34. Repairs to the damage rear end cost 40 minutes. Start number "17” still managed to move up to twelfth position from 18th. 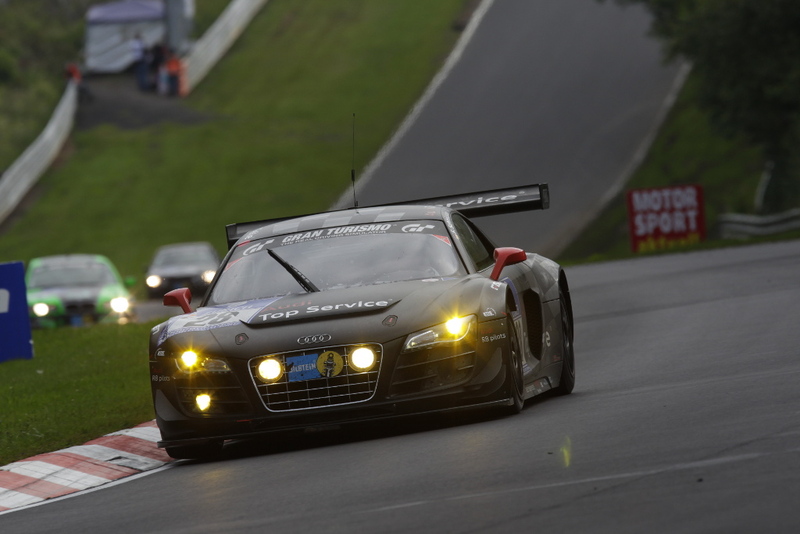 As a result, all four factory R8 sportscars that started saw the checkered flag. Audi race experience could also celebrate crossing the finish line: the Audi R8 LMS #28, in which professional race driver Frank Schmickler shared cockpit time with Audi driving experience customers, finished a remarkable 18th overall after a completely trouble-free race. 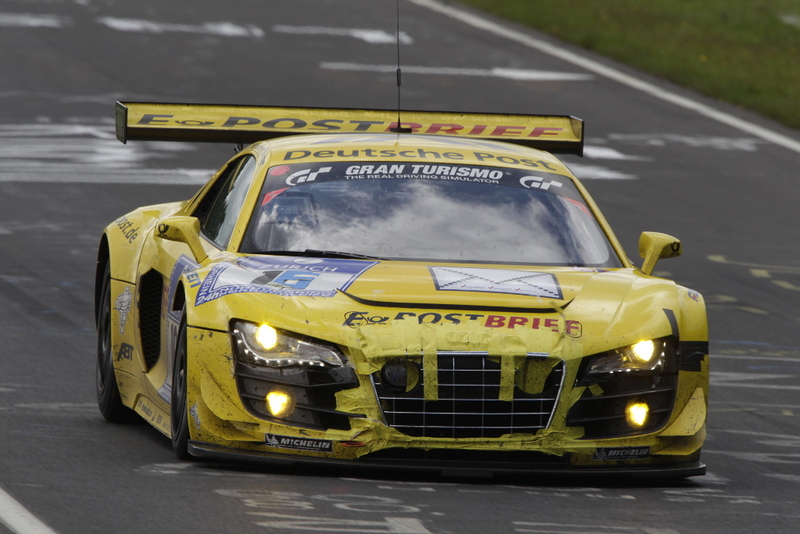 The second R8 LMS had an accident as early as the eleventh lap after a tire failed at the "Tiergarten” section. Driver Chris Vogler was uninjured. There was also joy and sorrow at Raeder Motorsport which fielded a brace of Audi TT RS on behalf of quattro GmbH. 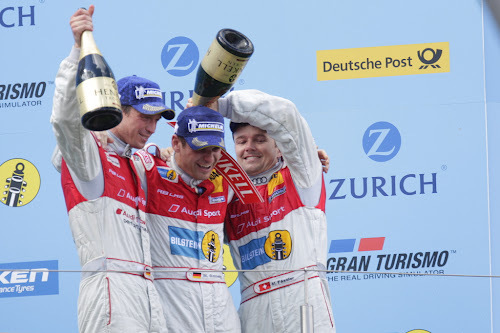 Despite a tire failure at the start of the race and a collision on Sunday morning, Michael Ammermüller, Frank Biela, Jens Klingmann and Martin Tomczyk made the finish as the best front-wheel drive car in an excellent 14th position overall and, in doing so, convincingly won their class in the development demonstrator. Christian Hohenadel/Jimmy Johansson/Miguel Molina Andrea Piccini lost 75 minutes in the second TT RS early on due to a faulty wastegate valve on the turbocharger and more time just before the end of the race because of a gear shift problem.